Hello! I am currently finishing up my pre-requisites to start nursing school and my boyfriend and I were discussing when we should start having children. 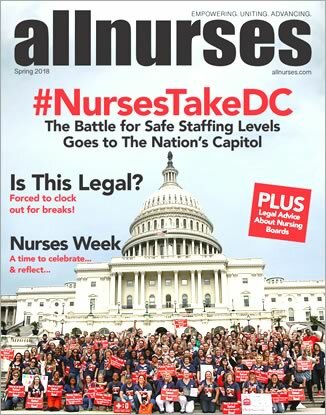 I need the perspective of nurses who have been in a similar situation and would like to know what you did and what would you suggest. I am 25 and he is 27 and we are planning to get pregnant two years from now which means I would be giving birth during my last semester at the age of 28. I was thinking of being maybe 6/7 months pregnant when graduating and taking the NCLEX a few weeks after graduation. My boyfriend would rather wait until I have a job and then we can start trying but my problem is that I don't want to have a child after the age of 30 (graduating at the age of 28, work for a year - will be 29 and then conceive and by the time I give birth Ill be 30 assuming I get pregnant within that year) and our parents will be much older and won't provide much help. The question is 1) would this be a good idea...? 2)How long would I have in order to get a job after taking my NCLEX, 3)would I be seen in a different light due to being pregnant and taking a break before working due to the pregnancy? 4) Could I just be maybe having baby fever..... or scared that the longer I wait my chances of having a healthy pregnancy diminishes...? I know I may be overreacting a bit but I just have this thing where I really don't want to be over 30 and having my first child... But please your suggestions and opinions would definitely mean a lot to me. I'm always amused by people who plan to "get pregnant Tuesday" and have the baby "Thanksgiving week" ...and with a boyfriend in his 20's who may or may not be around in two years. You're probably getting a little ahead of yourself, but I do agree that younger is better- especially if having children is important to you. Girl. Omg. As a woman rounding 30 myself, I can physically feel the baby rabies in your post, lol, and it's kind of stressing me out on a personal level. What is it about the age of 30 that is scaring you in terms of just beginning to start a family? I think you need to answer this for yourself and see how you feel about what you find out. If you know of specific medical issues you have that may contribute to difficulty conceiving, I can totally understand your concern. However, I think that having your first child around 30 probably wouldn't be as rough as you anticipate. Sure, your parents will be older - two years older than the timeline you seem to be pushing, which honestly isn't that much. If they are able and willing to help, they will do so at any age. But, you're the parents! It's all you guys, so you have to make sure that YOU are in a physical, financial, and spiritual place to have children. Only the two of you can determine what needs to happen before you do this. I have to say, being about to turn this age you seem to be wary of, I feel MUCH more prepared for the reality of having more than just me and my boyfriend to take care of - even more than just a couple years ago. Having the opportunity to get our careers underneath us, figure out where we want to live, and just be together has been very valuable and will play an instrumental role in our family life if we do decide to have kids. I don't think there's any hard rule about the time between NCLEX and getting a job, but it's a good idea to start something relatively soon, for your own benefit. That way you'll liketo what you've learned in school fresh and start to build on that knowledge. Another thing to consider is that nursing school is rough. People have totally had kids in the middle, pushed through, and become kickass nurses! I know that for me, I would have lost my mind and had a lot of trouble finishing. It is already going to cut into your time with your BF; can you imagine dividing what little free time you have even further in order to care for an infant? I think the benefit of waiting until you graduate is that you and BF can catch up, save some money, and just be you guys again, and really get your relationship ready for this big change. I feel your pain; baby fever is real and it is wild. What I keep reminding myself is that I don't want to steal the joy of this experience from myself by pushing it too early. If there are solid reasons to wait a couple years and only baby fever as justification for doing it sooner, I think it's worth it to stick it out. But only you and your boyfriend can decide your priorities. Sorry for the stream-of-consciousness post, lol, but hopefully it helps you further develop your thoughts and plans in a constructive way! I know 30 seems old to you, but it's not in terms of fertility. I didn't start having children until 30. Had my last at 41. Lol. I know!!! What a shocker!!! My youngest is a perfectly healthy baby boy. Mom to 3 boys here. I would not be pregnant in nursing school. It's too much, trust me on that. Had a miscarriage in nursing school. Being pregnant was hard first of all. The exhaustion and nausea were awful. The miscarriage was terrible. I had clinicals and tests while I was having the miscarriage and immediately after when I was a mess trying to grieve. I wanted to give up and quit. Fortunately I had a professor who wouldn't let me. Graduate, get a job, then get pregnant when you build up FMLA time. It's not awful to have a baby at 30, I promise!!!! Oh, and don't get pregnant with a boyfriend please. I know I sound old fashioned, but you should head on over to some forum sites with women who get pregnant by boyfriends and it can end up so messed up. Marriage affords legal protection. Maybe you can become pregnant on such a very VERY specific timeline, but I wouldn't count on it. If you are asking for advice, I would say to get a year of working behind you before you have a child. My DH and I already had a child when I started nursing school, and I had another one during, which interrupted my time in the program. It was incredibly stressful and difficult. It can be done with plenty of family/partner support, but I just wouldn't encourage it. If you have a specific physical reason which would impact your fertility at your age, I suppose that's a different discussion altogether. And if you are 6/7 months pregnant when you graduate, I suspect that it will be difficult to find a job. Of course, it'll have nothing to do with pregnancy discrimination. Then, you will want some time off to be with the baby. Now, you are looking at being an old new grad, which can negatively impact your job prospects. If you wait until you get a job, get through orientation and then get pregnant, you will be there for a year and you will be eligible for FMLA. It's really not that much different time wise. I have found that the best way to have things work out nothing like I pictured at all is to use the word "plan". OP, this includes having children. Just know that these responses are from those who have BTDT. I "didn't want a Christmas baby" ... so the good Lord blessed me with two. I also thought it would be really cool to have a baby in the fall (I don't know, because I loved fall?) so I got one in the beginning of June. Don't plan on delivering during the last semester. That would be no Bueno as you will have clinical hours to complete, with likely little flexibility. Also, if you wait until you have a job offer, you won't be covered by fmla until you've been there a year... and maybe not even short term disability for a while (6 months I see quite a bit). If you can plan it perfectly, I would get pregnant over a summer break, if you can financially swing that before graduation. Or immediately after graduation. Or after your first year of nursing. However, those are big ifs. It takes couples an average of 6 months to get pregnant. It took me and my husband 15 months with our first and 8 months with our second... that's with doing all the things and not having anything wrong. So surprise! It may not be that easy to pick when you get pregnant or give birth. Ultimately, it'll happen when it happens.... and you have to be flexible to an extent.